Why are customer satisfaction surveys important? What are the pros and cons of surveying? Supporters argue, how can we improve if we don’t know whether clients are really happy with our work? Our clients hate filling in long forms! And won’t our clients think it’s weird we’re surveying them when we talk to them almost every day? Client feedback, sought outside of the normal day-to-day contact with those clients, is critical. Days turn into weeks. Weeks turn into months, and the key clients you rely on for vital recurring revenue, can become disillusioned but find it hard to complain. 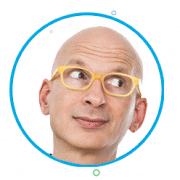 It’s how you ask them for feedback that’s the differentiator. It’s how you demonstrate an ongoing, service-oriented commitment to them without annoying them. How is the work we are doing for you going? How is the relationship between our two companies going? The biggest pitfall in finding out the answer to these two questions from professional services clientele is to borrow tools & techniques from the general “customer survey” industry. Most of these tools have been designed for mass market research rather than to supplement the client/agency relationship unique to professional services. That’s why many agencies and professional services companies feel uncomfortable sending them out; they are designed for another purpose entirely. Client surveys, especially long, online form-driven ones, are completely ineffective at evaluating both the “how are we doing?” and “how’s the relationship” questions. We’re all consumers. To make the point, how often do you fill out feedback forms after a car service or a flight? Most people hardly ever do it. And that is just fine for those businesses because they have large numbers of customers to survey, and can describe the attributes upon which they want to be rated alongside a few tick boxes. This however, is a completely inappropriate model for professional services where the relationship goes deeper and the impact of poor perception by a key client can have huge ramifications for the agency. So, in order to understand its clients, professional services companies have to find the right way to interact with clients on a regular basis about the quality of their work and the state of the relationship; often across multiple stakeholders and ongoing projects. Most survey results are collated at great effort and expense and then sit on shelves gathering dust – the opportunity to fix things has often completely passed, by the time the report is looked at in detail (if that ever happens). The diagram below puts this into context. The right way to conduct a customer satisfaction survey! – Click to view full size. Professional services firms must introduce a process of ongoing, direct interaction with the client at management level. Problems must be continuously unearthed and fixed in real-time. It’s your job as a professional services agency to monitor your performance on behalf of your client. If you leave it to them to evaluate you, they’ll only do it when things go wrong, and you’ll soon find yourself replaced. Aim to own the performance agenda with every client. When it comes to the “How are we doing for you?/How are you feeling about us” questions, it’s the prompting of a discussion that counts, not the actual answer they give you. Having a way of checking how customers are feeling every month is the best way to do it. “But it will take too long to ask every stakeholder every month across my key clients!” I hear you cry. Not if you find a way of automating it and responding where there are issues to be fixed or teams to be rewarded. That’s where Customer Thermometer comes in. 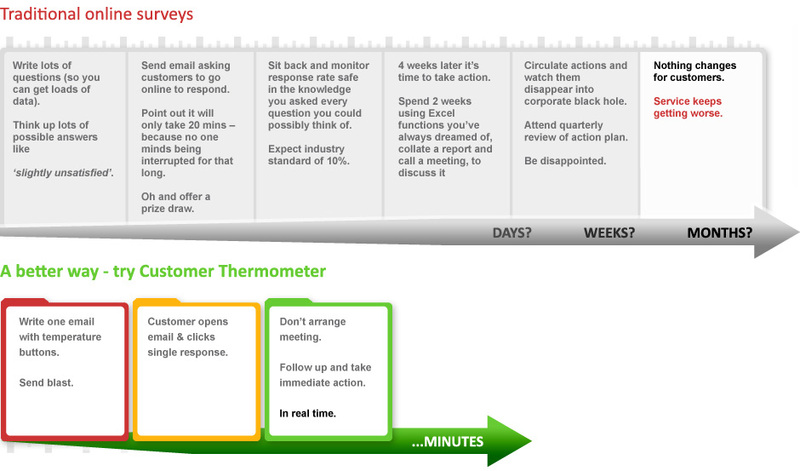 How does Customer Thermometer help? 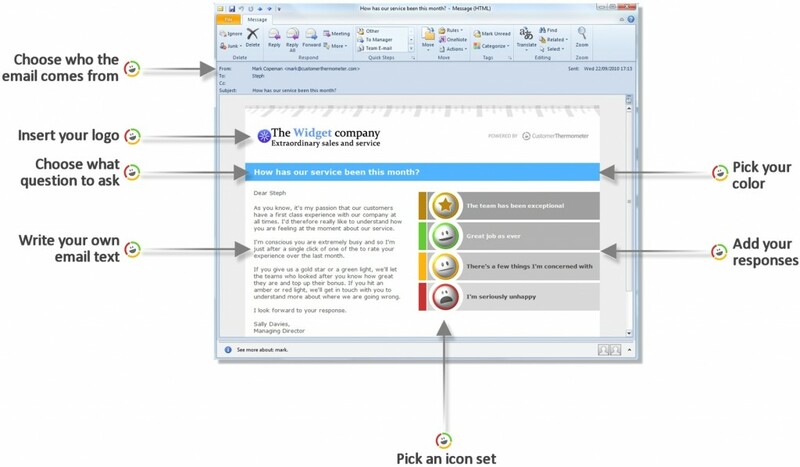 It’s a deceptively simple tool that allows you to customize a “How are we doing for you?” question and 4 possible answers, then, uniquely, sends this out via email for clients to respond to in real time by simply clicking a button. If they are delighted with your work, you can take the team who look after them out for a meal. If they are really disappointed with you, you can call the stakeholder straight away and fix the issue on the spot. The person in charge of the relationship can see every client response. However, it is also very useful if a more senior person is also alerted. In extreme client service recovery situations, there’s nothing like a phone call and a bunch of flowers or bottle of wine from the CEO. This approach means, no more surprises for you. And no more poor service for your clients. And you can monitor responses every month across all client accounts and all stakeholders, track trends, fix issues, spot superstars amongst your team. In almost every case we’ve come across, the client really appreciates being asked how they feel. Some agencies even introduce the concept of Customer Thermometer at pitch stage to highlight their service ethos, as well as showing their recent stats with other customers. Is it time to change the way you survey your clients? The critical question: how are we doing for you?